The lake has been an inspiration to poets and writers for centuries and is without doubt the most romantic lake in Italy and one of the most romantic places on earth. 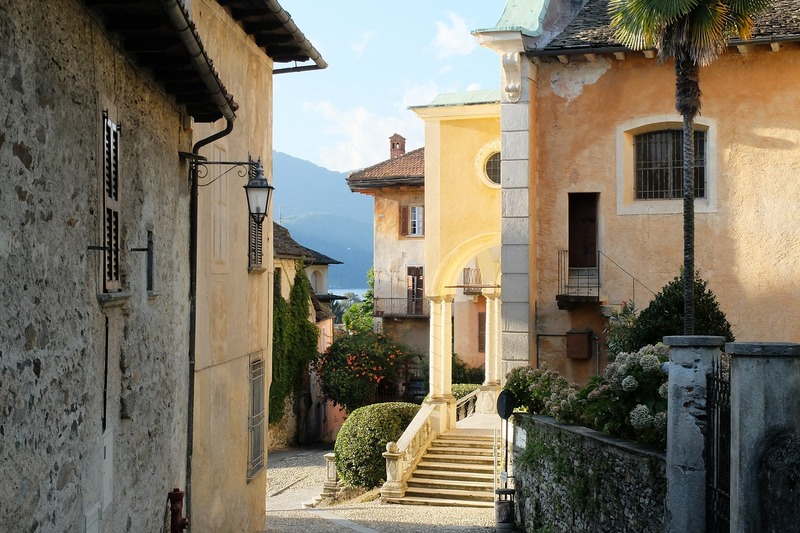 I have spent many a weekend here with my wife Maria - staying in various apartment and villas (click to view our favorite place and a map of where it and Lake Orta are). Invariably we come back home feeling more in love! Set in the middle of Lake Orta and dominated by its thirteenth century basilica and convent is the little island of San Giulio. You arrive by boat and then follow the pathway to peace and meditation, as the lane leading around the island is called. It truly is a gorgeous walk and you can't helped by feel moved, maybe even a little overwhelmed by the beauty of your surrounds. Lucky indeed are the nuns, the only permanent inhabitants, who live in the convent housed in the Abbey on the island. 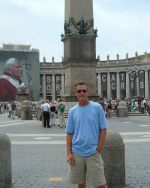 The island is completely dominated by the basilica, it is spectacular both from inside and out. The walls are covered by frescoes going back four hundred years and a the silent broody quality tends to put one in a very contemplative type of mood, which I suppose is the intention. 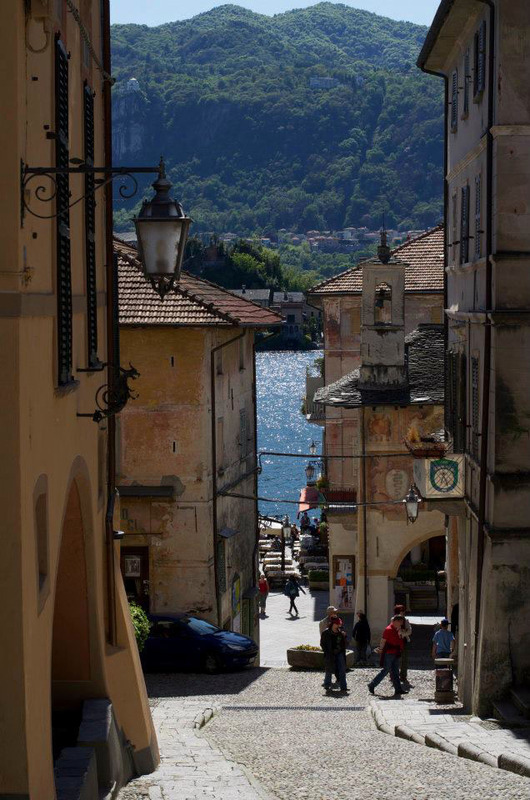 Stay in Orta San Giulio on the shores of the lake; a charming car-free town and not at all touristy. If you are going for longer or in a big group it's probably better to rent an apartment or villa (these are the ones I like). Otherwise the seventeenth century convent – don’t worry it’s now an excellent hotel - called the Hotel San Rocco (click for photos and details) is the place to stay. 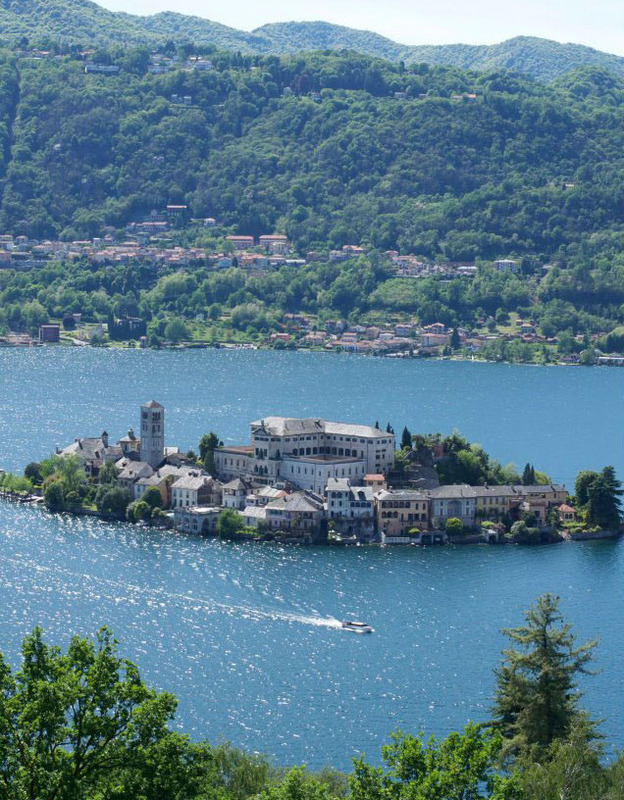 The hotel has great views over Lake Orta and a private boat to take guests out to the the island of San Giulio. Staying here is like being the star of your own fairy-tale movie. The restaurant in the Hotel San Rocco serves good food, representing Italian cooking from across Italy and is fantastic at hosting weddings. For more traditional fare, cheaper prices and a more rustic and down to earth atmosphere try the Taverna Antico Agnello (Via Olina 18). It's very popular with locals too, which is always a good sign. The central piazza of Orta San Giulio with its frescoed sixteenth century town hall, built on stilts, provides lovely views at night right across the lake towards the island of San Giulio which is lit up gorgeously. Enjoy a great sundowner/aperitivo here while watching the sunset or take an after dinner stroll with a "gelato" in hand. Leaving the centre of town you can follow the 1.5 km “Motta” path that leads up to Sacro Monte - a religious complex built between 1591 and 1700 and consisting of twenty chapels. From Orta San Giulio boats run across to the island, or if you are feeling more energetic you can rent a boat and row yourself over – not difficult as even I managed it. Prefer to visit Lake Garda? You must read Maria's guide! Looking for romance in Italy? This fairy tale castle is the answer!